I’m not going to b.s. you people. 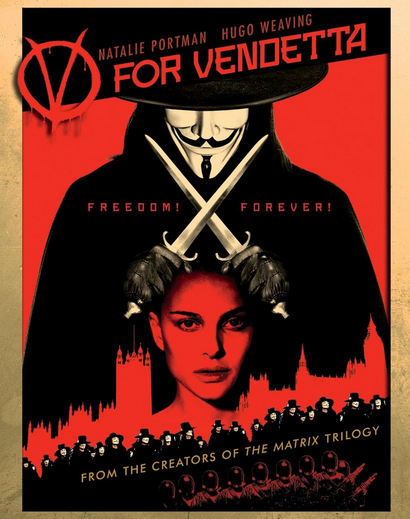 V for Vendetta is one of my favorite movies ever. It was the movie in college that shaped so much of my personal aesthetic. Everyone has one. This was mine. But since this is a wonderful Movie Challenge, I took some time and made this auspicious occasion special: I watched a Blu-Ray version of this movie. My first Blu-Ray ever. Gosh, these things make movies look pretty. The gist: Evey Hammond is an ordinary British woman, except for the fact that the Britain she knows is one in which everyone is under surveillance. An era of terror has given way to an era of caution, of letting the strongest people rule in exchange for safety. True enough, there are no more wars anymore. But there are also no more Muslims. No more gay people. No more political criticism. No more free speech. Evey lives in this world, and has accepted it. But then she meets V, a masked vigilante who seeks to mess with the government in the most blatant way possible. He doesn’t care about the dictatorship who now runs Great Britain. In fact, he’s willing to go to the ends of the earth to destroy it. Why? Because V remembers how things used to be in Great Britain, and slowly reminds Evey of the freedoms she too used to enjoy… and all that the new government has stolen from her. What I “learned”: There are certain movies where watching it on a big screen and enriched sound doesn’t enhance the movie at all. Then there are movies like this one, where it’s worth all the fuss. The Watchowskis, a brother-and-sister team most famous for being the visionaries behind The Matrix, apparently care very much about details. Every color, every breath and definitely every sound feels planned out. And that is definitely highlighted by having an enriched viewing system. Now, I’m not saying you should go out and buy one of the ridiculous curved TVs that were showcased at CES. I’m just saying that some works of art really are enhanced by looking under a microscope, and some just look like a mess of dots. See this movie if you like: Action movies that provide time to breathe between moments of awesomeness. V is certainly a master of stylistic combat, but he’ll also stick someone with a poison-filled needle if he feels like it. It’s all a matter of what he feels like. The set is also so incredibly detailed, you can’t help but feel that the Watchowskis were trying to avoid the quick and bloodless action scenes that have become commonplace in American action movies. This is too stylized, too pretty. It’s a different kind of experience entirely. Avoid this movie if: You loved the graphic novel version of V for Vendetta and are hopelessly devoted to that portrayal of the story. I totally feel you on that if so. I own the deluxe edition of the graphic novel, and have read it cover to cover. I completely understand why certain people will be outraged at this portrayal, of Evey in particular. So if you’re a purist, take heed.